Hairpin RNA (hpRNA) transgenes can be effective at inducing RNA silencing and have been exploited as a powerful tool for gene function analysis in many organisms. However, in fungi, expression of hairpin RNA transcripts can induce post-transcriptional gene silencing, but in some species can also lead to transcriptional gene silencing, suggesting a more complex interplay of the two pathways at least in some fungi. Because many fungal species are important pathogens, RNA silencing is a powerful technique to understand gene function, particularly when gene knockouts are difficult to obtain. We investigated whether the plant pathogenic fungus Fusarium oxysporum possesses a functional gene silencing machinery and whether hairpin RNA transcripts can be employed to effectively induce gene silencing. Here we show that, in the phytopathogenic fungus F. oxysporum, hpRNA transgenes targeting either a β-glucuronidase (Gus) reporter transgene (hpGus) or the endogenous gene Frp1 (hpFrp) did not induce significant silencing of the target genes. Expression analysis suggested that the hpRNA transgenes are prone to transcriptional inactivation, resulting in low levels of hpRNA and siRNA production. However, the hpGus RNA can be efficiently transcribed by promoters acquired either by recombination with a pre-existing, actively transcribed Gus transgene or by fortuitous integration near an endogenous gene promoter allowing siRNA production. These siRNAs effectively induced silencing of a target Gus transgene, which in turn appeared to also induce secondary siRNA production. Furthermore, our results suggested that hpRNA transcripts without poly(A) tails are efficiently processed into siRNAs to induce gene silencing. 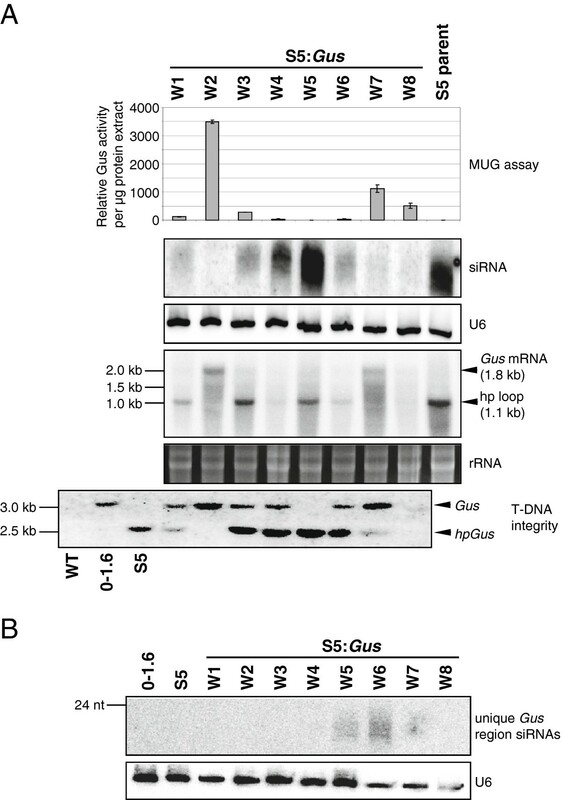 A convergent promoter transgene, designed to express poly(A)-minus sense and antisense Gus RNAs, without an inverted-repeat DNA structure, induced consistent Gus silencing in F. oxysporum. These results indicate that F. oxysporum possesses functional RNA silencing machineries for siRNA production and target mRNA cleavage, but hpRNA transgenes may induce transcriptional self-silencing due to its inverted-repeat structure. Our results suggest that F. oxysporum possesses a similar gene silencing pathway to other fungi like fission yeast, and indicate a need for developing more effective RNA silencing technology for gene function studies in this fungal pathogen. RNA silencing is an evolutionary conserved molecular mechanism that functions in genome defense and stability and also plays an important role in developmental regulation [1–3]. This process is characterized by the production of double-stranded RNA (dsRNA) molecules, which are cleaved by a Dicer-like protein (Dcl) into 20 to 25 nucleotide (nt) small RNAs (sRNA) that are subsequently incorporated into an Argonaute protein (Ago) located in the RNA-induced silencing complex (RISC). These sRNAs subsequently enable the RISC to identify complementary mRNA sequences, leading to their targeted degradation by the action of the Ago protein [4, 5]. However, not all sRNAs are dependent upon Dicer action and several other classes of sRNAs are produced by less well-characterized pathways that are restricted to certain kingdoms of life in some instances [6–10]. In general, the sRNA pathways in most fungal species have been poorly characterized. One of the better understood sRNA pathways in eukaryotes is the production of micro RNAs (miRNAs). These sRNA species are derived from endogenous genes and regulate developmental processes via post-transcriptional regulation of gene expression . Only recently miRNA-like genes (milRNA) have been identified in Neurospora crassa although their role in this fungal species remains unclear as does their distribution throughout the fungal kingdom . Dicer-independent small interfering RNAs (disiRNAs) and DNA damage-induced Qde2-interacting siRNAs (qiRNAs) have also been identified in Neurospora crassa[7, 8] but their occurrence in other fungal species is undetermined. In another well-studied fungus, Schizosaccharomyces pombe (fission yeast) only a single set of silencing machinery genes exists (for example, a single Dcl and Ago), which appear to function in both transcriptional and post-transcriptional silencing pathways [12–14]. Recent analyses of many fungal genome sequences have revealed that some fungal species, such as the Candida species, Saccharomyces cerevisiae and Ustilago maydis, may have lost the RNA silencing machinery genes entirely [15, 16]. In these fungal species alternative RNA-mediated pathways may be present to regulate gene expression. For instance in Saccharomyces cerevisiae trans-acting antisense RNAs have been demonstrated to play a role in gene regulation [17, 18]. These findings suggest that the fungal RNA silencing pathways may have evolved from a single, common ancestral pathway. The function of RNA silencing in fungal development is poorly understood, and mutation of RNA silencing genes resulted in an obvious phenotype only in few fungal species [19, 20]. In contrast, plant and animal RNA silencing mutants, particularly the miRNA pathway mutants, often display severe developmental defects. The RNA silencing mechanism has been exploited as a tool for gene functional analysis in many eukaryotic organisms, and expression of hairpin-forming transcripts is now reliably used in many animal and plant species to elucidate gene function. Such hairpin RNA (hpRNA) technologies are also the method of choice for a number of fungal species, particularly since gene knock-out mutants can be difficult to obtain in these organisms [21–24]. Whereas in plants and animals expression of hpRNA generally leads to siRNA production, this is not always the case in fungi. Different hpRNA constructs targeting endogenous genes or transgenes have been tested in several fungal species with varying success (reviewed by [22, 24]). In addition, hpRNA expression in some fungi such as fission yeast resulted in not only post-transcriptional silencing, but also heterochromatin formation [14, 25, 26]. In this study, we investigated hpRNA transgene-induced silencing in the fungus Fusarium oxysporum. We provide evidence indicating that, although the RNA silencing machinery exists in this fungus, hpRNA transgenes are usually transcriptionally silenced and ineffective at inducing post-transcriptional silencing of target genes. Our study provides new insights into the RNA silencing mechanisms in this fungal pathogen. It also adds to the current understanding of RNA silencing in fungi and supports the notion that RNA silencing processes are more divergent in fungi than in plants or animals, with different fungi possessing alternative mechanisms that may be species specific. In order to develop a reporter gene system for studying RNA silencing in Fusarium oxysporum, the F. oxysporum strain 5176 was transformed with a Gus construct under the regulatory control of the gpdA promoter (Figure 1). Twenty independent lines were isolated and all exhibited varying degrees of Gus activity, as determined by the fluorimetrical assay using 4-methylumbelliferyl-β-D-glucuronide (MUG) (Figure 2). The majority of Gus lines contained a single T-DNA insertion and no correlation between transgene copy number and Gus activity was apparent (Figure 2). Schematic diagrams (not to scale) of transgenes introduced into Fusarium oxysporum . All Gus-derived sequences are shown in black, except a small region of the Gus ORF represented in grey, which is present in the full length Gus gene but absent in the hpGus constructs. The gpdA promoter is shown as an open arrow, while the transcription terminator sequence trpC is indicated as an open box. Sequences present in hairpin constructs of the Gfp and F. oxysporum Frp1 are shown as light grey regions in each construct, respectively. An intron from the pyruvate dehydrogenase kinase gene (pdk) is included in the hpGfp gene. The hygromycin phosphotransferase gene (hyg) and Streptomyces verticillius bleomycin gene (phle) were used as selectable markers for F. oxysporum transformation and are shown as dark grey arrows. The positions and expected fragment sizes of restriction endonuclease recognition sites used for DNA blot analyses are indicated. Relative Gus activity of Fusarium oxysporum lines containing the Gus gene. Gus activity was measured by MUG assays of at least three biological replicates of each line. The Y-axis depicts Gus activity per μg of protein extract, while each column on the X-axis represents the activity of a single transgenic line. Standard deviations are indicated on each column. The number of Gus T-DNA insertions present in each line is indicated below the X-axis and was determined by DNA blot hybridization using a probe specific for the hygromycin selectable marker gene. Lines 0–1.3, 0–1.6 and 1–1.3 were used for subsequent hpGus transformation. To study hpRNA-induced silencing, wild type (WT) F. oxysporum, plus three Gus lines that showed low, intermediate and high Gus activities (lines 0–1.3, 0–1.6 and 1–1.3, respectively), were chosen for super-transformation with a hpRNA Gus (hpGus) construct (Figure 1). As additional controls, these fungal strains were also transformed with another hpRNA construct (hpGfp) (Figure 1), and an empty vector control construct (pKR1). All three constructs contain common gpdA promoter and trpC terminator sequences. Multiple independent transformants were obtained for all constructs (Table 1) and mycelial fractions were analyzed for Gus activity. Super-transformants of Gus lines 0–1.3 and 0–1.6 showed a mixture of Gus positive and negative colonies regardless of the construct used for transformation. In contrast all, except one, super-transformants of line 1–1.3 maintained Gus activity (Table 1). aMycelia fractions were incubated with X-glucuronide solution at 37°C overnight and the number of white and blue colonies counted. It is worth noting that only white or dark blue, but not light blue staining was observed. The absence of Gus activity in the Gus-negative lines could be due to either silencing of the Gus gene by the hpGus construct, or loss of the Gus target gene by homologous recombination with the super-transformed constructs that share the common promoter and terminator sequences. PCR analysis was undertaken on all 0–1.3 and 0–1.6 hpGus transformants (additionally, on all 0–1.3 hpGfp and control transformants, as well as on four 0–1.6 control and seven 0–1.6 hpGfp transformants) to determine if the colonies that do not display Gus activity had also lost the Gus transgene. A region unique to the Gus transgene was used for PCR analysis and amplification products were only obtained from transformants that maintained Gus activity (data not shown). This result indicated that the absence of Gus expression was due to loss of the Gus target gene but not due to hpGus-induced silencing. The occurrence of Gus-negative super-transformants in the 0–1.3 and 0–1.6 but not the 1–1.3 background is likely because lines 0–1.3 and 0–1.6 only carry a single T-DNA insertion that can be deleted by a single recombination event, whereas line 1–1.3 contains three separate T-DNA insertions, which are unlikely to be all lost by recombination events. Several hpGus and hpGfp transformants of WT and Gus lines 0–1.3 and 0–1.6 were analyzed for the presence of siRNAs expected to be derived from processing of the hpRNA transcripts from these transgenes. No line producing Gfp-specific siRNAs was identified out of the nine hpGfp transgenics examined (Table 2). Among the 28 hpGus lines analyzed, the majority (25) did not show siRNA accumulation (Table 2, Figure 3 and [see Additional file 1: Figure S1]). Only three hpGus lines produced detectable levels of Gus-specific siRNAs; S5 (in the WT F. oxysporum background), S14, and S34 (both in the 0–1.6 background), hereafter referred to as S5, S14 and S34, respectively. MUG assays indicated that a significant reduction in Gus activity was apparent in S34 extracts along with reduced levels of Gus mRNA (Figure 3). aLines that showed production of Gus-specific siRNAs or rearrangement following super-transformation are indicated in parentheses. n.a. not applicable, n.d. not determined, WT wild type. Analysis of β-glucuronidase hairpin RNA ( hpGus ) transformants of β-glucuronidase reporter transgene ( Gus ) line 0–1.6 and wild type (WT) Fusarium oxysporum . Identification of small RNAs produced in hpGus transgenics by RNA blot analysis (top panel). Total RNA (15 μg) was separated on a 17% polyacrylamide gel and probed for Gus siRNAs. Numbers above each lane designate an independent hpGus transformant in either 0–1.6 parent (left) or WT (right). As a loading control the same membrane was hybridized with a probe specific for the U6 transcripts and is shown below. RNA blot detection of Gus transcripts in the analyzed transgenic lines (second panel). Total RNA (10 μg) was hybridized with a probe specific for the region unique to Gus. The position of this unique region in the Gus gene is indicated in Figure 1, for further details see Methods. The ethidium bromide stained ribosomal RNA bands are shown as loading control. Gus activity of 0–1.6 hpGus transformants (third panel) was determined by MUG assay. Shown is the relative Gus activity per μg of protein extract for each transgenic line. 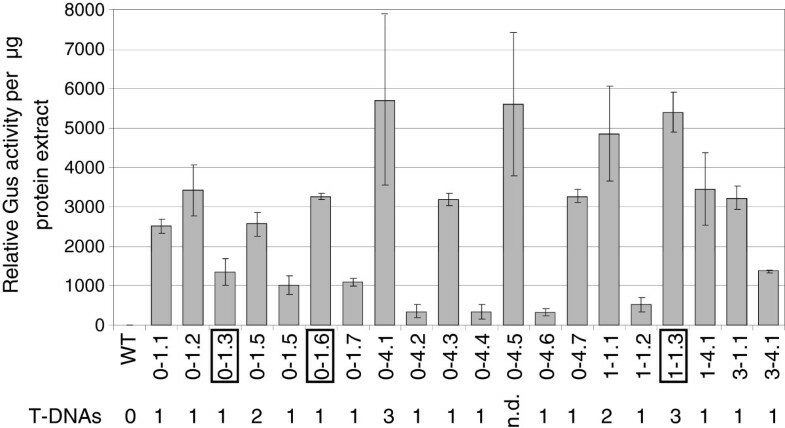 Error bars indicate standard deviation of at least two independent biological replicates. MUG assay of line S34, indicated with an asterisk, shows significantly reduced Gus activity (t-test: p = 0.004). DNA blot analysis of hpGus transformants of line 0–1.6 to determine integrity of the Gus and hpGus transgene loci (bottom panel). Genomic DNAs were digested with EcoRI and SalI and hybridized with a full length Gus probe. Intact hpGus and Gus transgenes produce conserved 2.7 kb and 3.2 kb restriction fragments, respectively. To further characterize the hpGus lines, genomic DNA was digested with EcoRI and SalI and hybridized with a Gus probe, to detect two conserved fragments corresponding to the Gus and hpGus transgenes, respectively, if these genes were intact (Figure 1). All lines that did not show siRNA accumulation were found to have intact hpGus transgenes (Figure 3 and [see Additional file 1: Figure S1]). However, for S34, which produced significant amounts of siRNAs, both the Gus and hpGus-specific restriction fragments were absent, and instead, a large hybridizing band was observed (Figure 3), indicating that recombination had occurred between the pre-existing Gus transgene locus and the incoming hpGus transgene. Similarly, recombination also appeared to have occurred in line S14 [see Additional file 1: Figure S1]. 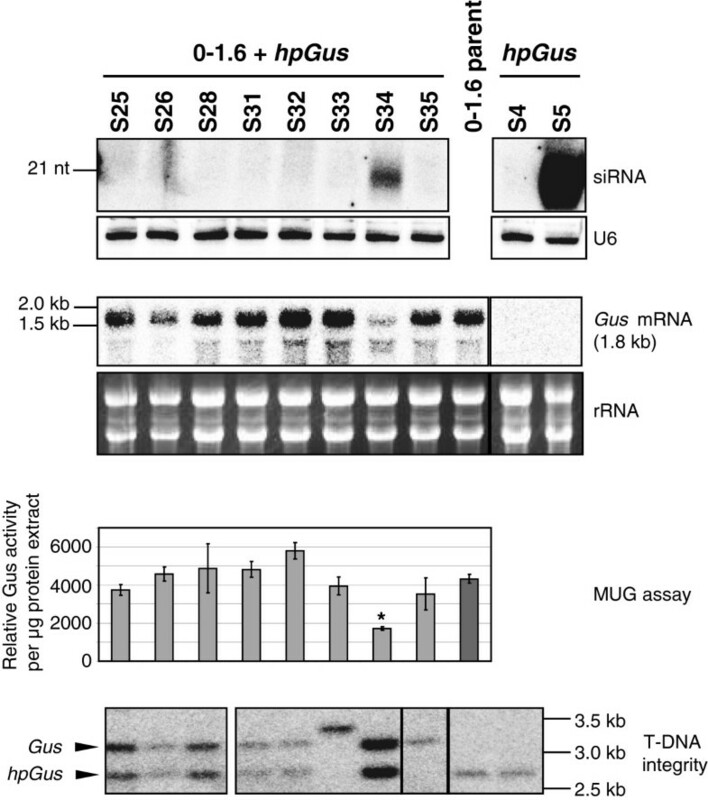 As shown below, line S5, which was the only WT hpGus transformant generating Gus-specific siRNAs, contains a distinct T-DNA insertion pattern that allowed transcription of the hpGus sequence by an endogenous element. Thus, our result showed that intact hpRNA transgenes do not produce detectable amounts of siRNAs, and only transgenic lines with particular T-DNA structures or insertion patterns give rise to siRNAs. It was previously shown that unprocessed hpRNA or dsRNA can be detected using northern blot hybridization in hpRNA lines of plants accumulating siRNAs [27, 28]. We therefore used northern blot hybridization to examine if siRNA accumulation in the hpGus F. oxysporum lines was correlated with the expression of dsRNA. RNA samples were treated with RNase One and hybridized for the presence of a 550 nt antisense Gus fragment, equivalent to the size of the hpGus dsRNA arm. The predicted nuclease-resistant RNA fragment was only detected in RNA from lines that produced siRNAs (that is, S34 and S5), and not in lines that produced no detectable siRNAs (Figure 4). However, hybridizing signals were detected in untreated RNA samples of all siRNA-negative lines tested (S23 to S26) (Figure 4). The pattern of these hybridizing bands was equivalent to the pattern observed in plants expressing the same hpGus transcript , indicating that hpGus is expressed in these fungal lines. However, the level of the hybridizing signals were low compared to the siRNA-generating lines (S34 and S5), suggesting that the hpGus transgene is poorly transcribed in the siRNA-negative lines. The gpdA promoter driving the hpGus was PCR amplified and sequenced in these siRNA-negative lines and found to be unaltered (data not shown), indicating that the low level of hpGus transcription was not caused by sequence changes in the promoter. Additionally, DNA blot analysis confirmed the presence and integrity of both hpGus and Gus transgenes in the transformants analyzed (Figure 3 and [see Additional file 1: Figure S1]). These data suggest that the hpGus transgene is usually subject to transcriptional inactivation in F. oxysporum, generating insignificant amounts of hpRNA precursor for siRNA production, and that the dsRNA precursor detected in lines S5, S14 and S34 are derived from transgenes in a specific genomic context(s) that enables active hpRNA or dsRNA transcription. These data also indicate that F. oxysporum possesses the necessary machineries for processing dsRNA or hpRNA into siRNAs. Double-stranded Gus RNA is detected in lines that produce small interfering RNAs (siRNAs). Total RNAs from hpGus transgenic lines was treated either with (+) or without (−) RNase One prior to RNA blot analysis. Hybridization with a full length Gus probe detected a 0.55 kb fragment only in strains which produce siRNAs (that is, S34 and S5). The 0.55 kb RNA fragment is derived from annealing of the complementary arms of hpGus precursor to form a 0.55 kb dsRNA fragment that is resistant to RNase One digestion. Shown below is the ethidium bromide-stained RNA gel used for hybridization, demonstrating equivalent loading and extensive RNA cleavage following RNase One digestion. In addition to the Gus reporter gene, we also tested the efficacy of hpRNA-induced silencing on an endogenous gene, Frp1. Frp1 was chosen as a target because F. oxysporum with a loss-of-function mutation of this gene has been shown to be nonpathogenic on tomato [29, 30]. Wild type F. oxysporum was transformed with an hpFrp transgene (Figure 1), and nine independent transgenic lines were chosen for subsequent analyses. Both precursor hpFrp transcripts as well as Frp-specific siRNAs were detected in eight of these lines, and levels of the siRNAs and precursor hpRNA were correlated (Figure 5; top and middle panels). Again this indicates that F. oxysporum possesses the functional RNA silencing machineries required for siRNA biogenesis. However, the abundance of siRNA again appeared low. Furthermore, a strong reduction in endogenous Frp1 mRNA levels was not observed in any of the eight lines, presumably as a consequence of the low siRNA levels (Figure 5; bottom panel). Target mRNA analysis using northern blot hybridization detected smaller sized (approximately 1.7 kb) hybridizing bands (indicated by an arrow), which were absent in the WT control and in hpFrp line 7 that had no detectable levels of siRNAs (Figure 5; bottom panel). These bands likely represent cleavage products of the Frp1 mRNA, suggesting that siRNA-mediated cleavage had occurred, although further experiments are needed to characterize the fragments. Taken together, the data on the hpFrp transgenic lines further suggest that hpRNA transgenes are not highly expressed in F. oxysporum and therefore do not generate sufficient levels of siRNAs required for effective silencing of target genes. Endogenous genes can be targeted by hpRNA-derived small interfering RNAs (siRNAs). Wild type (WT) Fusarium oxysporum was transformed with a hpRNA construct directed against the endogenous Frp1 gene. Total RNA (15 μg) from nine independent transgenic lines was separated on a 17% polyacrylamide gel and hybridized with a probe specific for Frp1. 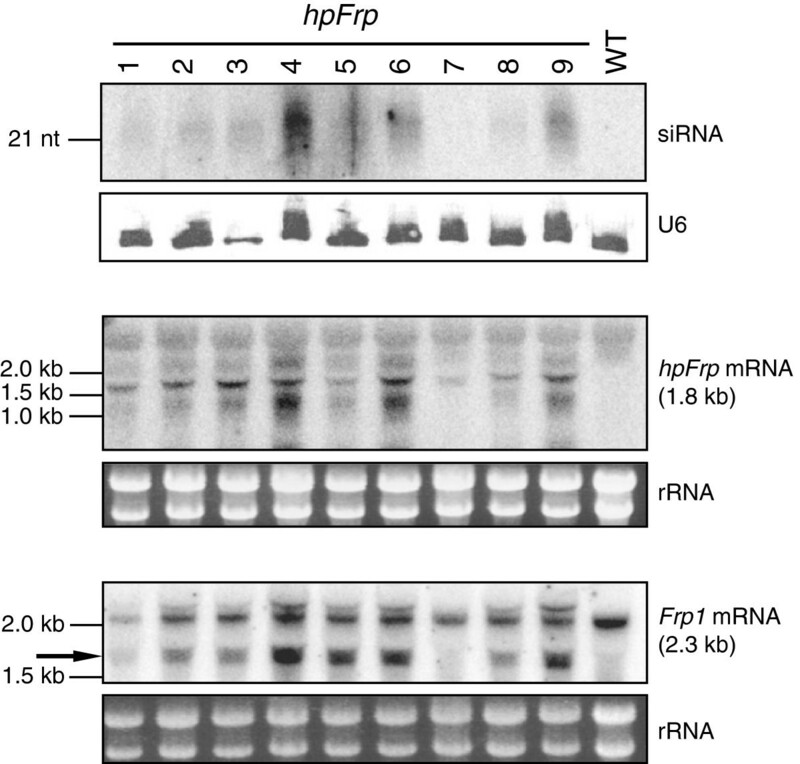 The hpFrp-derived siRNAs were detected in most lines although the levels are very low (upper panel). The U6 transcripts are shown as loading control. Total RNA (10 μg) was separated on an agarose gel and hybridized with an Frp1 sense probe to detect antisense sequences of the hpFrp transgene (middle panel). To detect Frp1 mRNA levels, total RNA (10 μg) was hybridized with a probe specific for the 3′ region of the endogenous Frp1 gene, which is not present in the hpFrp gene, detecting 2.3 kb Frp1 mRNA, but not hpFrp transcripts (lower panel). Ethidium bromide-stained ribosomal RNA is shown as loading control. The additional transcripts detected are likely to be either Frp1 mRNA cleavage products (below the endogenous transcript band) or size mobility shifted endogenous Frp1 likely due to binding of small RNAs (above the endogenous transcript band), as both are not present in the WT sample. S34 was the only transgenic line identified in which significant downregulation of the target Gus gene was associated with the accumulation of Gus-specific siRNAs (Figure 3). However, DNA blot analysis indicated the absence of both the Gus and hpGus-specific restriction fragments (Figure 3), suggesting that the target Gus gene had undergone rearrangement following super-transformation. Therefore, the reduction in Gus activity in line S34 may be due, in part, to changes in gene expression following this transgene rearrangement rather than a direct result of siRNA-mediated mRNA cleavage. We therefore investigated if siRNAs are capable of inducing effective silencing in F. oxysporum by super-transforming line S5, which showed high levels of Gus-specific siRNAs, with the Gus construct and subsequently measuring the Gus expression levels in the resulting super-transformants. As shown in Figure 6A, with the exception of line S5:Gus W2, all of the eight S5:Gus super-transformants showed greatly reduced Gus expression in comparison to the Gus lines shown in Figure 2. Furthermore, the level of Gus mRNA was in general inversely correlated with the level of Gus-specific siRNAs (Figure 6A). β-glucuronidase hairpin RNA ( hpGus )-derived small interfering RNAs (siRNAs) can mediate target transcript downregulation. (A) Strain S5, which contains the hpGus transgene and produces siRNAs (see Figure 3), was super-transformed with the Gus transgene to obtain S5:Gus lines W1 to W8. Relative Gus activity was determined by MUG assay (top panel). The mean of at least two independent biological replicates is shown with error bars representing the standard deviation. The second panel shows RNA blot analysis of 15 μg of total RNA hybridized with a full length Gus probe to detect small RNAs. The U6 transcripts are shown as loading control. Expression levels of the Gus and hpGus transgenes are shown in the fourth panel. Total RNA (10 μg) was hybridized with a full length Gus probe, detecting the1.8 kb transcript derived from the Gus transgene and the 1.1kb fragments corresponding to the single stranded loop region of the hpGus transcript. Ethidium bromide-stained ribosomal RNA bands are shown as loading control. DNA blot analysis was performed to determine transgene integrity (bottom panel). Genomic DNA was restricted with EcoRI and SalI, and hybridized with a full length Gus probe. Restriction fragments corresponding to the hpGus (2.7 kb) and Gus transgenes (3.2 kb) are present in most lines, indicating that both transgenes remain intact. (B) Secondary siRNAs are produced in some of these lines. Total RNA (15 μg) from S5:Gus lines W1 to W8 were resolved on 17% polyacrylamide and hybridized with a probe specific for the unique region that is present only in the Gus but not the hpGus transcript (see Figure 1 and Methods for details). Low levels of Gus-specific siRNAs were identified in lines W5 to W7. The U6 transcript is shown as loading control. To exclude the possibility that the low Gus mRNA levels were due to transgene rearrangement, DNA blot analysis was performed. Five out of the eight S5:Gus super-transformants contained the predicted Gus and hpGus-specific restriction fragments (Figure 6A). These five super-transformants showed low levels of Gus activity as well as low levels of Gus mRNA along with the presence of siRNAs, indicating that the reduced Gus expression is due to siRNA-mediated mRNA cleavage. To demonstrate that RNA silencing was occurring in these lines, Gus mRNA cleavage products were cloned from RNA of line S5:Gus W4 using 5′ RACE (see Methods). Several individual fragments were sequenced and found to represent four distinct cleavage sites within the Gus mRNA, indicating that siRNA-mediated target mRNA cleavage had occurred (see below and Table 3). aNucleotides 556–792 correspond to the unique region of the Gus gene. bThe first 555 nucleotides of the Gus gene were used to construct the double stranded arm region of the hpGus gene. cShown are the nucleotide (nt) numbers of the Gus gene between which cleavage had occurred and dhow often this fragment was recovered. It is noteworthy that in all five lines that contained both the Gus and hpGus transgenes, the levels of siRNAs were lower than in the initial parental line S5. This reduction in siRNA level implies that the presence of target mRNA may destabilize complementary small RNAs in F. oxysporum. This possibility is consistent with the observations that expression of miRNA target mimic transcripts reduces the level of the respective miRNA in plants  and that miRNA decay rates are dramatically enhanced by the presence of highly expressed target genes in human cells . F. oxysporum S5:Gus transformants were also used to investigate whether an amplification mechanism, through which secondary siRNAs are generated, exists in this fungal species. A probe that is specific for the unique region of the Gus transgene, and therefore does not recognize the hpGus sequence (see Methods), was hybridized to RNA from the eight S5:Gus lines. Low levels of small RNAs derived from this unique region of the Gus transgene were detected in the S5:Gus lines W5 and W6 (Figure 6B). These small RNA species were derived from sequences outside of the hpGus transgene and are therefore likely to be generated by an amplification mechanism. The lack of such siRNAs in the other S5:Gus lines could be explained by different transgene insertions having different susceptibility to silencing amplification as observed for transgenes in plants (for example, ). However, this result does not exclude the possibility that the small RNAs detected in lines W5 and W6 were generated due to specific integration patterns of the newly introduced Gus transgene alone, but independently of the pre-existing hpGus transgene. As described above, lines S14 and S34 each contained a single, aberrant restriction fragment in DNA blot experiments, when hybridized with a Gus-specific probe, whereas the conserved Gus and hpGus-specific fragments were absent (Figure 3 and [see Additional file 1: Figure S1]). In each line this unique restriction pattern is likely to be a consequence of hpGus transgene integration within the Gus transgene, such that Gus activity was lost in S14, but retained in S34, and both strains were capable of producing siRNAs (Figure 3 and [see Additional file 1: Figure S1]). To determine the nature of this insertion event in line S34, a lambda phage library was created and a phage colony which contained the entire Gus locus isolated and sequenced in its entirety. Sequencing indicated that line S34 carried an inverted repeat of the Gus sequence created by integration of the gpdA promoter, together with the upstream half of the dsRNA arm of the hpGus construct, in antisense orientation downstream of the full-length Gus ORF (Figure 7A). This rearrangement is consistent with a single 3.2 kb SalI fragment being present in genomic DNA of this line upon DNA blot hybridization with a Gus specific probe (Figure 3). Given the rearrangements apparent at this locus and the significant level of Gus activity, it is likely that the RNA is transcribed by the gpdA promoter of the resident Gus target gene, and that this RNA encodes both, a functional Gus protein and a hpRNA template for siRNA production. Presumably this transcription is inefficient, explaining the comparatively low siRNA and Gus transcript levels in this line (Figure 3). Analysis of the transgene re-arrangments in Fusarium oxysporum lines S34 and S5. (A) Schematic diagrams (not to scale) of the transgenes in F oxysporum lines S34 and S5. The structure of the S34 locus was determined by sequencing of a lambda phage clone containing this entire region and was derived likely by recombination between the pre-existing Gus transgene and an incoming hpGus transgene, such that the full length Gus ORF is followed by the 550 nt antisense Gus arm and the gpdA promoter, both derived from the hpGus transgene. The resulting hairpin-like Gus sequence is flanked by convergent gpdA promoters. Details of both transgenes prior to the recombination event are shown in Figure 1. Fox, F. oxysporum genomic sequences; λT3 and λT7, lambda phage T3 and T7 RNA polymerase binding sites. (B) The hpGus transcripts in strain S5 were likely derived from an endogenous promoter 3′ of the T-DNA insertion site. Total RNA (10 μg) from the Gus 0–1.6 parent (left lane), 0–1.6 hpGus lines (middle two lanes) and WT hpGus lines (right two lanes) was hybridized with a probe detecting antisense trpC terminator sequences. TrpC antisense sequences were only present in line S5, suggesting that these transcripts are produced by an endogenous promoter located downstream of the hpGus integration site. (C) Hybridization of total RNA (10 μg) with an antisense Gus probe specific for the loop region of the hpGus transgene, detecting transcripts that contain sense Gus sequences. Transcripts derived from the resident Gus transgene (1.8 kb) were detected in all samples except S5, which does not carry the Gus transgene. The 1.1 kb Gus sequence detected only in RNA of S5, corresponds to the hairpin loop region, likely produced by dicer processing of a correctly folded hairpin transcript. Next we investigated why hpRNA was efficiently transcribed in line S5. As the gpdA promoter of the hpGus transgene generally did not produce high levels of hpGus RNA and Gus-specific siRNAs (Figure 3 and [see Additional file 1: Figure S1]), it was possible that siRNAs present in line S5 were derived from an endogenous promoter downstream of the T-DNA insertion site (Figure 7A). 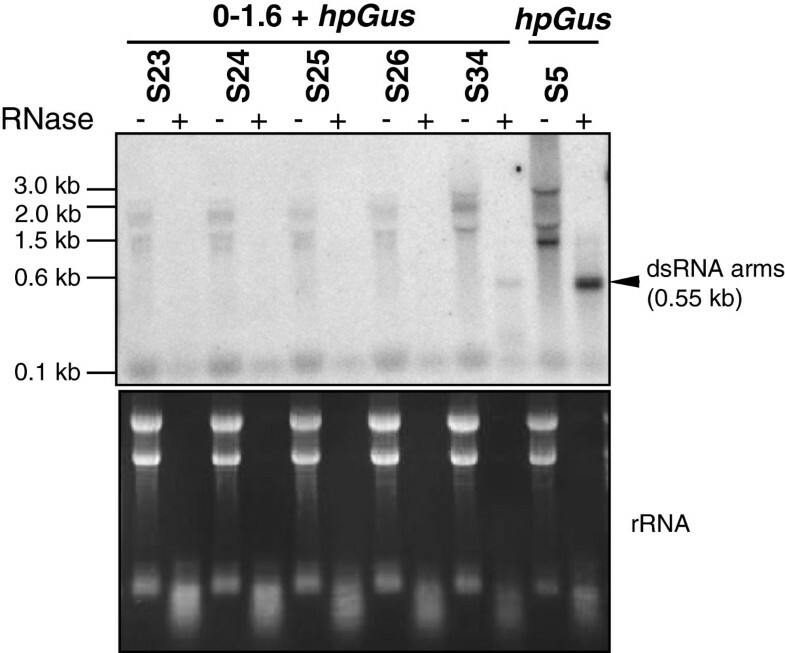 RNA blot analysis using a probe specific for hpGus precursor transcripts detected a smear of hybridizing signals in S5 RNA (Figure 4), indicating the expression of hpGus RNA of varying size. When RNAs were hybridized with a probe specific for antisense trpC terminator sequences (Figure 1, Figure 7A), multiple transcripts were detected in line S5, which were absent in other hpGus transformants (Figure 7B). This indicated that transcription occurred in the opposite orientation to the gpdA promoter of the hpGus transgene, presumably by an endogenous promoter adjacent to the T-DNA insertion site. Several attempts of tail-PCR were made to clone the flanking endogenous sequence but were unsuccessful. The presence of multiple hybridizing bands is likely due to the absence of a transcription termination signal that can stop transcription from the endogenous promoter. Similarly, when RNAs were hybridized with a probe that would only detect sense hpGus loop sequences (hence indicating transcription from the opposite direction), a one-kilobase fragment, consistent with the size of a processed sense loop transcript, was present in line S5 RNA, but not in RNAs of other hpGus transformants (Figure 7C). Such full-length processed loop fragments are typical of hpRNA expressed in plants . Thus, in both lines S34 and S5, hpRNA appears to be transcribed by an endogenous promoter gained through specific transgene integration events from a resident transgene or endogenous gene, but not by the transgenic promoter of the original hpGus transgene cassette. Our analyses of the hpGus lines raised two possibilities. First, hpRNA transgenes in the F. oxysporum genome are highly susceptible to transcriptional inactivation, possibly due to the inverted repeat DNA structure, resulting in lack of siRNA production. Second, based on the analyses of lines S34 and S5, dsRNA transcribed from a terminatorless transgene, which would lack polyadenylation, may be more efficiently processed into siRNAs. To test these possibilities, a construct was generated (conP-Gus; Figure 8A), which contained two convergent promoters that bi-directionally transcribe a 1.1 kb sequence of the Gus ORF to generate dsRNA. This construct contained no terminator sequences and therefore both sense and antisense Gus transcripts, were expected to lack poly(A) tails. The construct was transformed into F. oxysporum line 0–1.6, which contains an actively expressed Gus gene. Analysis of β-glucuronidase ( Gus ) 0–1.6 transgenics carrying the conP-Gus constructs. (A) Schematic diagram (not to scale) showing details of the T-DNA region of the conP-Gus construct. The Gus sequence consists of the 3′ 1.1 kb of the Gus ORF and is shown in black. The convergent promoters driving transcription are shown as open arrows. The Streptomyces noursei nouseothricin gene was used as selectable marker (clonNAT, Werner BioAgents, Germany) and is shown in grey. Total RNA (15 μg) was separated on 17% polyacrylamide gels and probed for Gus-derived small interfering RNAs (siRNAs) (upper panel). No small RNA species were detected in any of these lines. U6 transcripts are shown as loading control. To determine Gus transcript levels, total RNA (10μg) was separated by agarose gel electrophoresis and hybridized with a probe specific for the region unique to the Gus transgene, not present in the conP-Gus gene (middle panel). Most lines show reduced Gus mRNA levels. Detected fragments are likely either cleavage products (below the Gus fragment) or size shifted due to siRNA binding (above the Gus fragment). Ribosomal RNA bands are shown as loading control. All transgenic lines were analyzed for Gus activity, which was carried out by MUG assay in at least two independent biological replicates (bottom panel; error bars show standard deviation). All conP-Gus transformants showed significantly reduced Gus activity (*t-test: P < 0.003). (B) Gus transcription occurred from both transgenic promoters. Total RNA (500 ng) was reverse transcribed using Gus-specific primers Gus-RT2 or Gus-RT3 (see schematic). Fragments were amplified from cDNA or no RT control RNA using primers Gus-RT2 and A-RT2 (trpC transcript), or Gus-RT3 and A-RT3 (gpdA transcript). Products were separated on a 2% agarose gel. Fragments of the correct size were obtained for both promoters, indicating that dsRNA could be produced in these lines. All nineteen independent F. oxysporum lines carrying the conP-Gus construct analyzed showed a significant reduction in Gus activity as determined by MUG assays, in addition to exhibiting greatly reduced Gus mRNA levels (Figure 8A). No evidence of transgene rearrangement was observed by DNA blot analysis in any of these lines (data not shown). The observed reduction in Gus activity and Gus mRNA levels in conP-Gus lines is therefore likely to be a consequence of dsRNA-induced RNA silencing. Consistent with this, the Gus sequence of the conP-Gus construct was found to be transcribed in both sense and antisense orientation by the convergent promoters (Figure 8B), indicating the likelihood of Gus dsRNA formation. The uniform expression of the sense and antisense RNAs across the two independent lines analyzed, suggests that this transgene is not as prone to transcriptional inactivation as the hpGus transgene, possibly due to a lack of the inverted repeat DNA structure. 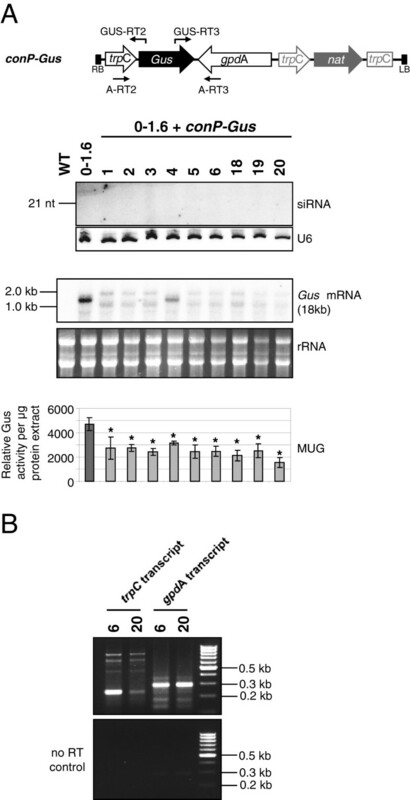 However, Gus-specific siRNAs could not be clearly detected in any of the conP-Gus transformants (Figure 8A), even after small RNA enrichment [see Additional file 1: Figure S3], presumably because siRNA levels were extremely low. This implies that in vivo formation of dsRNA through annealing of two separate RNA transcripts is less efficient than through folding of two complementary sequences within the same hpRNA transcript. This is consistent with the observation in plants where co-expression of sense and antisense RNAs from two separate transcription units is generally less effective in inducing target gene silencing . As a comparison to conP-Gus, we also transformed line 0–1.6 with a construct that would allow transcription of a sense Gus sequence with a poly-A tail plus convergent transcription of an antisense Gus sequence without a terminator sequence (conP-Gus-ter; [see Additional file 1: Figure S2A]). However, we could not detect transcription past the trpC terminator sequence from the gpdA promoter [see Additional file 1: Figure S2B] possibly due to a bi-directional transcription termination property of the trpC terminator. Also, no significant reduction in Gus mRNA levels or Gus activity was observed in these transgenic lines [see Additional file 1: Figure S2C]. 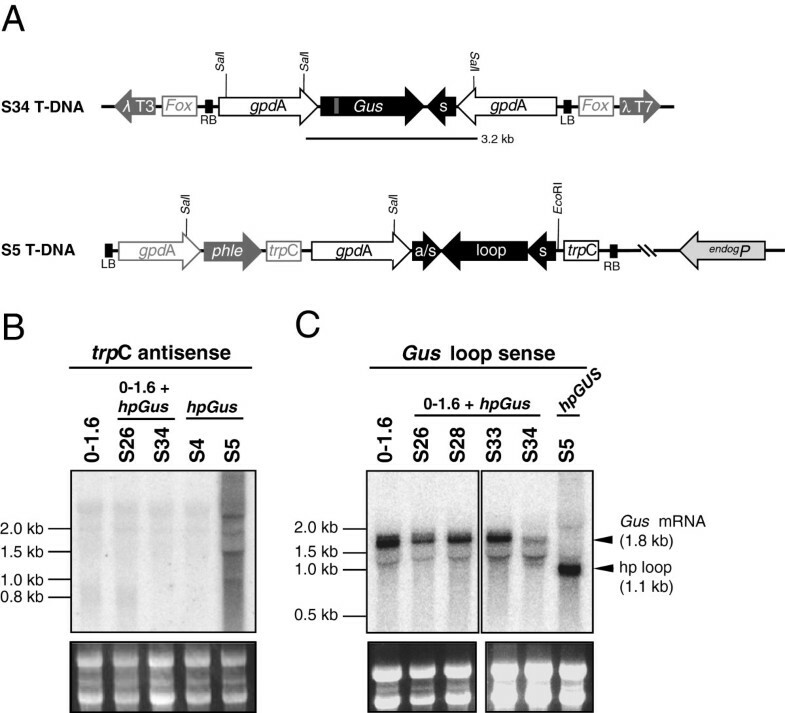 This result suggests that the transcription of both sense and antisense Gus RNA is required for the observed Gus silencing with the conP-Gus construct. The lack of antisense Gus transcription by conP-Gus-ter construct prevented us from examining if the addition of ploy(A) might inhibit the silencing-inducing effect of the converging construct. The results presented in this paper demonstrate that unlike Ascomycete fungi (reviewed by [22, 24]) hpRNA transgenes do not reliably lead to the production of siRNAs in F. oxysporum. Neither hpGus nor hpGFP transgenes were found to produce siRNAs in this species. Transformation with an hpRNA construct targeting the endogenous Frp1 gene did lead to siRNA production in the majority of analyzed transformants; however, the abundance of siRNAs was low and no strong silencing of the Frp1 gene was observed. In Neurospora crassa, the arm length of the hpRNA constructs was critical for efficient silencing ; however this was not a factor affecting the hpGus and hpGfp constructs used in this study, which were well within these design parameters. The inclusion of a spliceable intron into the hairpin loop region, which has been shown to promote efficient siRNA processing in plants , also did not induce siRNA production in F. oxysporum (Table 2). However, our results indicate that F. oxysporum does possess functional RNA silencing machineries which process hairpin precursor transcripts into siRNAs that target homologous mRNA for cleavage. Introduction of the hpFrp transgene led to production of siRNAs in the majority of lines, resulting in cleavage of the target Frp1 mRNA, although the level of silencing is not high. Similarly siRNAs could be produced from hpGus RNA transcribed from an endogenous promoter (as in line S5) or a promoter of an actively expressed resident transgene (as in line S34). Furthermore, siRNAs in line S5 were capable of inducing effective silencing of the super-transformed Gus gene. Thus, F. oxysporum contains RNA silencing machineries required for both dsRNA processing and for siRNA-directed silencing, which is consistent with the identification of multiple Dicer and Argonaute-like genes from the Fusarium oxysporum strain 4287 genome using bioinformatics [see Additional file 1: Table S2]. A question is therefore why hpRNA transgenes investigated here were not effective at generating siRNAs and inducing silencing in F. oxysporum. Three independent studies in S. pombe utilizing the Ura4 gene as a target have shown that hpRNA transgenes can direct both heterochromatin formation (transcriptional gene silencing) and post-transcriptional gene silencing, depending on the location of the targeted gene within the host genome [14, 25, 26]. This suggests that an hpRNA transcript in fission yeast can activate two independent gene silencing pathways, transcriptional and post-transcriptional. It is noteworthy that fission yeast contains only a single set of RNA silencing proteins which mediate both heterochromatin formation and post-transcriptional silencing, suggesting that these two pathways are mechanistically linked. It is possible that hpRNA also induces transcriptional silencing in F. oxysporum, which can target the hpRNA transgene itself to cause transcriptional self silencing. A recent study in plants has indicated that hpRNA transgenes are subject to self silencing through siRNA-directed DNA methylation, a plant-specific transcriptional gene silencing pathway . Northern blot analysis indicated that the hpGus and hpFrp transgenes were poorly transcribed in the transgenic F. oxysporum lines, suggesting that they were transcriptionally silenced. However, a DNA methylation analysis of the hpGus transgene failed to detect any methylation at either locus (data not shown), suggesting that DNA methylation is not involved in the transcriptional silencing, but that histone modification might be responsible as in the case of transcriptional silencing in fission yeast . While the strong and constitutive gpdA promoter of the hpRNA constructs failed to confer high levels of hpRNA and siRNA expression in F. oxysporum, the hpGus RNA was efficiently transcribed by an endogenous element, presumably the promoter of an actively expressed endogenous gene, which was accidentally acquired by T-DNA integration. Furthermore, the gpdA promoter of the resident Gus target gene was also able to transcribe the hpRNA formed by DNA rearrangement between the Gus and the hpGus transgenes. This implies that promoters of newly introduced hpRNA transgenes are more susceptible to transcriptional silencing than those of genes already residing in the genome which are actively expressed. Consistent with this possibility, transgene promoters are highly susceptible to hpRNA-induced transcriptional inactivation in plants whereas endogenous promoters are usually resistant to hpRNA-induced transcriptional silencing . Our results suggest that non-polyadenylated dsRNA is efficiently processed by Dicer into siRNAs in F. oxysporum. Lines S5 and S34 both produced small RNA species and both lacked transcription terminators for hpRNA transcription and are therefore likely to produce non-polyadenylated precursor transcripts. Furthermore, bi-directional transcription of a Gus sequence from convergent promoters (conP-Gus) without transcription terminators consistently downregulated Gus mRNA levels. It is possible that Dicer processing of dsRNA occurs in the nucleus of F. oxysporum, and therefore non-polyadenylated dsRNA is a preferred substrate because of its possible retention in the nucleus after transcription. However, further work is needed to test this idea. Also, as no siRNAs were detectable in plants transformed with the convergent promoter construct, it cannot be ruled out that an alternative, siRNA-independent, mechanism may account for the conP-Gus-induced gene silencing. We demonstrate here that RNA silencing machineries exist in F. oxysporum, however conventional hpRNA transgenes are not effective at inducing gene silencing due to poor transcriptional activity of the transgene. Convergent promoter transgenes are capable of inducing gene silencing, but with low silencing efficiency. Future studies should focus on achieving potent and consistent RNA silencing in F. oxysporum by preventing transcriptional silencing of hpRNA or other types of dsRNA transgenes. Alternatively, the transcriptional silencing mechanism may be exploited to develop effective gene silencing technology in F. oxysporum. All chemicals and media were obtained from either Sigma (Sydney, NSW, Australia) or BDH (VWR International, Radnor, PA, USA). Hybond membranes were obtained from Amersham Biosciences (GE Healthcare Australia, Rydalmere, NSW, Australia). Potato Dextrose Agar (PDA, Sigma) and Potato Dextrose Broth (PDB, Sigma) were both used at half strength and PDA was supplemented with 12.5 g/l agar. PDA or PDB containing 0.1 M Tris- HCl pH 8 was used for phleomycin selection. Luria Bertani (LB) medium contained per liter 5 g yeast extract, 5 g tryptone and 10 g NaCl, supplemented with 15 g/l agar for solid media. Induction Medium contained 10 mM KH2PO4, 10 mM K2HPO4, 2.5 mM NaCl, 4 mM (NH4)2SO4, 0.5% glycerol, 9 μM FeSO4, 10 mM glucose, 40 mM MES buffer pH 5.3, 0.7 mM CaCl2 and 2 mM MgSO4. Induction agar was the same as induction medium except it contained 5 mM glucose and 0.2 μM acetosyringone. SDS/BSA hybridization solution contained per liter 70 g SDS, 10 g BSA, 122.4 g Na2HPO4 × 12 H2O, 25 g NaH2PO4 and 10 mM EDTA pH 8.0. Northern hybridization solution contained 50% formamide, 1% SDS, 5 × SSPE buffer (3 M NaCl, 0.2 M NaH2PO4 and 0.02 M EDTA pH 7.4) and 5 x Denhardt’s solution (2% Ficoll 400, 2% PVP and 2% BSA). DNA extraction buffer contained 0.5 M NaCl, 0.1 M Tris- HCl pH 8.0 and 50 mM EDTA pH 8.0. protein extraction buffer contained 50 mM NaPO4, 10 mM EDTA pH 7.0, 0.1% Triton X-100, 0.1% Sarkosyl and 10 mM ß-mercaptoethanol. MUG assay buffer was protein extraction buffer containing 2 mM 4-methylumbelliferyl-ß-D-glucoronide hydrate (MUG). Fusarium oxysporum f.sp. conglutinans strain 5176 was grown at 28°C in either liquid PDB shaking at 200 rpm or on solid PDA. For long-term storage of Fusarium, conidia of 1 ml from a liquid culture were collected by centrifugation, suspended in 500 μl of 15% glycerol and stored at −80°C. Agrobacterium tumefaciens strain AGL0 was used for Fusarium transformation as it produced the largest number of transformants compared to other strains. AGL0 was grown at 28°C in liquid LB medium or on solid LB plates supplemented with 20 μg/ml rifampicin and the appropriate antibiotic to select for the binary vector. E. coli strain DH5α was used for construction, propagation and amplification of plasmid DNA and was grown in liquid or on solid LB medium supplemented with the appropriate antibiotic at 37°C. For all primer sequences see Additional file 1: Table S1. The gpdA promoter sequence [Genbank Z32524] was amplified using the gpdA-F1 primer containing a terminal EcoRI site and the gpdA-R1 reverse primer carrying the restriction enzyme recognition sites AfeI, AflII, EcoRV, XbaI, HindIII and KasI. Similarly, the trpC terminator sequence [Genbank X02390] was amplified using the trpC-R1 reverse primer containing a terminal KpnI site and the trpC-F1 forward primer carrying the enzyme recognition sites XbaI, HindIII, KasI, HpaI, ClaI and BamHI. The two fragments were combined into a single construct by overlapping PCR, thus creating a multiple cloning site (MCS) located between the gpdA promoter and trpC terminator. The fusion fragment was ligated into pGEM-T Easy (Promega, Madison, WI, USA), verified by sequencing and termed pUS1. The coding sequence of the bacterial UidA (Gus; [Genbank AAC74689]) gene was ligated into the EcoRV site of plasmid pUS1 and the entire cassette excised using EcoRI. The overhangs were end-filled with Pfu (Promega) polymerase and the fragment ligated into the EcoRV site of the fungal binary vector pPZPHyg . The resulting vector was verified by sequencing and termed pPZPHyg-Gus (Figure 1). The fungal binary vector pKR1 was based on vector pRW1p , which was extended to contain a MCS flanked by the gpdA promoter and trpC terminator. Using Pfu polymerase and the primer pair trpC-F2 and trpC-R2, the trpC terminator was amplified by PCR and ligated into the EcoRV site of vector pBC sk + (Stratagene), creating pBC-trpC. A SpeI recognition site was introduced into pAN9-1 (a derivative of vector pAN7-1 ) immediately 3′ of the gpdA promoter by site-directed mutagenesis. The gpdA promoter was then excised using EcoR1 and SpeI, end-filled using Pfu polymerase and ligated into the SmaI site of pBC-trpC to create pBC-gpdA:trpC. The gpdA:trpC fragment was then removed from pBC-gpdA:trpC using XbaI and HindIII and end-filled. The vector pRW1p was restricted with EcoRI and BamHI, end-filled and re-ligated to remove several endonuclease recognition sites. 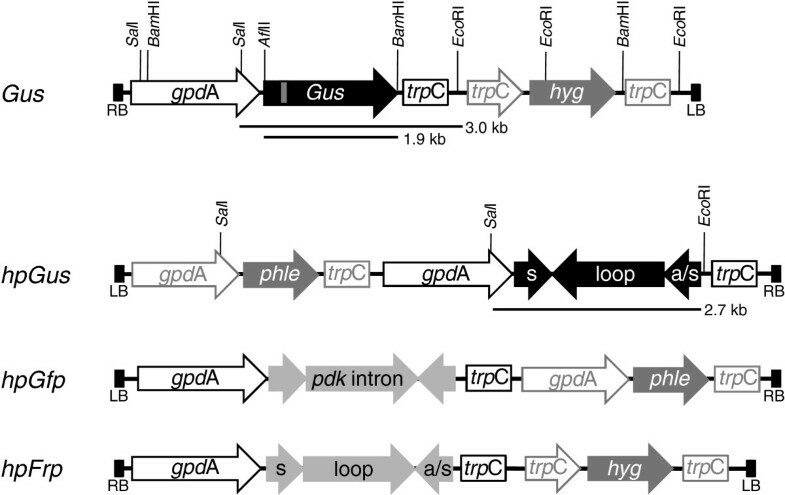 The vector was then digested with XbaI and HindIII, end-filled and ligated with the gpdA:trpC fragment from plasmid pBC-gpdA:trpC to create the vector pRW1p-gpdA:trpC. The lacZ gene was PCR amplified with Pfu polymerase using the primers lacZ-F and lacZ-R, which carried the recognition sites of 14 unique restriction enzymes, thus creating a lacZ gene flanked by a MCS. This fragment was ligated into the SmaI site of vector PSP72 (Promega), released from PSP72 by digestion with EcoRI and MunI and then ligated into the EcoRI site of pRW1p-gpdA:trpC. The resulting vector was then restricted with HindIII and re-ligated to excise the lacZ gene, leaving the MCS in place and creating the binary vector pKR1. The construction of the hpGus sequence was described previously . Basically, the Gus gene, which contained two EcoRV sites at 562 nt and 793 nt, was digested with EcoRV and re-ligated to remove the internal 231 nt EcoRV region. This was to prevent the expression of a functional Gus protein. This 231 bp region is therefore unique to the Gus gene and not present in the hpGus gene and was used as a template for the preparation of radioactive probes to distinguish between the hpGus and full length Gus transcripts. The resulting fragment (approximately 1.6 kb) was ligated at the 3′ end to a 606 bp 5′ Gus fragment (up to the first HincII site of the Gus ORF) in an antisense orientation, forming an inverted repeat (or hpGus sequence) containing a approximately 560 bp complementary sequence interrupted by a 1.1 bp Gus fragment (Figure 1). The hpGus gene was transferred from the pGEM-T Easy vector into pKR1 using EcoRI and ApaI. To create the hpGfp construct for expression in fungi, an existing hpGFP sequence was excised from vector pUQC218 EcoRI digestion, end-filled with Pfu DNA polymerase, and ligated into the EcoRV site of pUS1. The resulting expression cassette was then excised using EcoRI and ligated into the EcoRI site of pRW1p to create the binary vector pRW1p-hpGfp. This vector mediates expression of an hpRNA that contains the pdk intron in spliceable orientation (Figure 1). The hpFrp gene was constructed in similar fashion to the hpGus gene. A long Frp fragment (nt 39–1063 of the Frp1 gene [Genbank AY673970]) was amplified by PCR using the forward primer frpL-F with a 5´ terminal AflII recognition site and the reverse primer frpL-R with a 5´ terminal HindIII recognition site. A short frp fragment was PCR amplified using the forward primer frpS-F with a 5´ terminal BamHI site and the reverse primer frpS-R with a 5´ terminal HindIII site. The two fragments were successively ligated into the AflII/HindIII and HindIII/BamHI sites of pUS1. The cassette was released via EcoRI digestion, the overhangs filled using Pfu polymerase and the fragment ligated into the EcoRV site of vector pPZPhyg to create pPZPhyg-hpFrp (Figure 1). The 3′ region (nt 1064 onward) of the frp1 gene was not included in hpFrp and the terminal 492 nt (nt 1090 onward) were used as a template for synthesis of radioactive probes to differentiate between the hpFrp gene and endogenous Frp1 transcript. The trpC promoter and trpC terminator were amplified by PCR using primers trpC-PrF, trpC-PrR and trpC-TF, trpC-TR, respectively. The two fragments were combined by overlapping PCR, creating a promoter:terminator sequence (pro:ter) interrupted by ApaI and EcoRI restriction sites. After cloning into the pGEM-T Easy vector, the pro:ter fragment was transferred into the pPZPnat1 vector [GenBank:AY631958] using XbaI and PstI to create pPZPnat-pro:ter. Then, the 1.1 kb 3′ region of the Gus gene was excised from a pGEM-T Easy vector carrying the Gus ORF and ligated into vector pPZPnat-pro:ter via the ApaI and EcoRI sites. Subsequently, the gpdA promoter was excised from pUS1 using BamHI and PstI and ligated behind the trpC terminator sequence. This was achieved such that the gpdA promoter and the trpC promoter were in convergent orientation (Figure 8). To create the final conP-Gus construct, the trpC terminator sequence was deleted through EcoRI and BamHI digestion, and the remainder of the plasmid was end-filled using Pfu polymerase and re-ligated (Figure 8). All plasmids were verified by sequencing prior to use. Transformation of Fusarium was achieved by co-cultivation of conidia with Agrobacterium adapted from . AGL0 carrying the binary vector of interest was grown in 7.5 ml of LB medium with appropriate antibiotics for two days at 28°C, the cells of 1 ml of the culture collected by centrifugation and suspended in 20 ml of induction media. Cells were incubated at 28°C for a further 6 h. Fusarium conidiospores were grown in PDB for two days, filtered through miracloth (Calbiochem, Merck KGaA, Darmstadt, Germany) and the optical density at 600 nm (OD600) measured. The spore content was calculated using a standard curve. Conidia were collected by centrifugation at 4,000 rpm for 10 min, suspended in water and the concentration adjusted to 1E6 spores/ml. Then, 100 μl Fusarium spores were mixed with 400 μl AGL0 and 300 μl plated on induction agar overlayed with a Hybond membrane. After 48 h incubation at 28°C the membranes were transferred onto PDA containing either 50 μg/ml hygromycin or 50 μg/ml nourseothricin as well as 100 μg/ml timentin, or 25 μg/ml phleomycin and 250 μg/ml of cefotaxime. Cefotaxime selection was substituted with timentin after the first round of selection. Individual transformants were transferred onto fresh selective medium. Genetically pure cultures were obtained by plating 25 μl of a spore suspension (1E3 spores/ml) on a selective plate and subsequent isolation of a star colony. To generate the biomass required Fusarium mycelium was obtained and harvested as described in . For DNA isolations mycelium was ground in liquid N2 and the powder suspended in 500 μl DNA extraction buffer and 50 μl of 10% SDS and incubated at 50°C for 10 min. The DNA was extracted with 500 μl phenol/chloroform and subsequently with 500 μl chloroform and ethanol precipitated at −20°C overnight. The pellet was washed with 75% ethanol, air-dried and the DNA suspended in TE buffer containing RNase. RNA was isolated using Trizol Reagent according to manufacturer’s instructions and the pellets suspended in either water or formamide. DNA and RNA concentrations were measured using the NanoDrop ND-1000 (Thermo Fisher Scientific, Waltham, MA, USA). A total of 5 μg of genomic DNA was digested overnight, the DNA phenol/chloroform purified and ethanol precipitated. The fragments were separated on a 1% agarose gel at 2 V/cm over night. The gel was incubated in 0.25 M HCl for 10 min, then in 1.5 M NaCl and 0.5 M NaOH for 30 min, followed by a 30 min washing step in 1.5 M NaCl and 0.5 M Tris- HCl pH 7.5. The DNA fragments were transferred to Hybond-N+ membrane by standard capillary transfer in 20 × SSC over night and then cross-linked to the membrane using a UV crosslinker (Stratagene, Agilent Technologies, Mulgrave, VIC, Australia). Pre-hybridization was carried out in SDS/BSA hybridization solution for at least 3 h prior to adding the probe. Probes incorporating 32P-dCTP were prepared using the Megaprime DNA Labelling System (Amersham) according to manufacturer’s instructions. The probes were purified using Amersham G50 columns, denatured at 100°C for 5 min, kept on ice for 10 min and then added to the membrane. Hybridization was carried out in approximately 20 ml SDS/BSA Hybridization solution at 65°C over night. Membranes were washed three times in 2 × SSC + 0.1% SDS for 10 min at 65°C before exposure to a Phosphorscreen. For mRNA northern blotting 10 μg of total RNA was separated on a 1.3% agarose formaldehyde gel and the fragments transferred to Hybond-N membranes by standard 20 × SSC capillary transfer over night. The RNA was cross-linked to the membrane in a UV crosslinker and the membrane pre-hybridized at 42°C in northern hybridization buffer for at least 3 hours. Hybridization was carried out at 42°C overnight and membranes were washed twice in PES buffer (0.04 M NaPO4, 0.2% SDS and 1 mM EDTA pH 7.2) at 65°C before exposure to a Phosphorscreen. For siRNA northern analysis, 15 μg of total RNA were separated on a 17% polyacrylamide-urea gel and the fragments transferred to Hybond-N+ membrane by electro-blotting. The RNA was cross-linked to the membrane by UV crosslinking. All hybridization and washes were carried out at 42°C. Membranes were pre-hybridized in northern hybridization buffer for at least 3 hours prior to adding the probe. Hybridization was carried out overnight and membranes washed twice in 2 × SSC + 0.2% SDS prior to exposure to a Phosphorscreen. Probes were prepared by in vitro transcription incorporating 32P-UTP using the Riboprobe Combination System (Promega) according to manufacturer’s instructions. Probes were precipitated with 7.5 M ammonium acetate and suspended in 20 μl TE buffer. Probes for siRNA northern analysis were treated with a carbonate solution (80 mM NaHCO3 and 120 mM Na2HCO3) at 60°C and then precipitated with 7.5 M ammonium acetate. Screens were developed using a Phorphorimager (FLA-5000; Fujifilm Corporation, Tokyo, Japan). Gus activity in mycelial fractions was assessed by incubating samples with X-glucuronide solution (0.1 M NaPO4, 10 mM EDTA pH 7.0, 0.5 mM potassium ferricyanide, 0.5 mM potassium ferrocyanide, 1 mM X-Glucuronide and 0.1% Triton X-100) at 37°C for several hours or overnight. For quantitative Gus activity analysis, a small sample of mycelium was obtained as described in  and ground with sand in 50 to 100 μl protein extraction buffer for 30 s using a glass rod and drill. The samples were centrifuged at 4°C for 5 min and the protein concentration of the supernatant measured by standard Bradford Assay. MUG assay was performed as described previously  and the Gus activity determined from the slope of the curve using Excel. Gus activity in each sample was calculated relative to the total amount of protein in the cell extracts. A DNA/RNA adapter was ligated to the free 5′ phosphates of DNase treated total RNA samples. Four μg of total RNA were incubated with 40 pmol of adapter, 50 mM HEPES buffer pH 7.5, 1 mg/ml BSA, 8% glycerol, RNaseOut (Invitrogen, Life Technologies Australia, Mulgrave, VIC, Australia) and T4 RNA ligase (Promega) in 1 × T4 RNA ligase buffer for 2 h at room temperature (RT). The RNA was phenol/chloroform extracted and suspended in 12 μl RNase-free water. Reverse transcription of 6 μl of ligate was carried out using gene specific primers G us-RT1 or G us-RT2. RACE products were amplified by PCR using an adapter primer and a gene-specific nested primer (Gus-RT1n or Gus-RT2n) and obtained fragments were separated by agarose gel electrophoresis. Fragments were excised from the gel, eluted using the Ultra Clean DNA Purification Kit (Mo Bio Laboratories, Carlsbad, CA, USA) and ligated into the pGEM-T Easy vector for sequencing. Total RNA samples were treated with RNase-free DNase One to remove all contaminating genomic DNA. Samples were analyzed for purity by PCR of an endogenous gene prior to reverse transcription. Reverse transcription was carried out using gene-specific primers and SuperScript III Reverse Transcriptase (Invitrogen) according to manufacturer’s instructions. For subsequent PCR reactions 0.5 μl of cDNA was used as template. The library was prepared from genomic DNA of Fusarium oxysporum line S34. The library was created using the Lambda Dash II/BamHI vector kit (Invitrogen). All steps were performed according to manufacturer’s instructions. Genomic DNA was partially digested using Sau3A and size fractionated by centrifugation through a sucrose gradient. The layer containing fragments of approximately 10 kb size was used for ligated into the pre-digested lambda vector to create the library. Plaque lifts and subsequent DNA blotting was performed to identify phage plaques that carry Gus-specific sequences. Phage DNA from an individual pure phage lysate was extracted as described in . Entire lambda phage was sequenced to determine the nature of the Gus-specific region. Plasmid DNA was sequenced using Big Dye Terminator v3.1 (Applied Biosystems, Life Technologies Australia, Mulgrave, VIC, Australia) according to manufacturer’s instructions. Reactions were ethanol precipitated, run using a 96 capillary 3730 DNA Analyser (Applied Biosystems) at the John Curtin School of Medical Research, Australian National University, Canberra and analyzed using the Vector NTI program suite. Sequencing of the lambda phage DNA was carried out using the Ion Torrent Platform at the John Curtin Institute, Australian National University, Canberra and analyzed using the CLC Genomics Workbench (CLC bio, Taipei, Taiwan). transcription termination sequence or promoter sequence of the Aspergillus nidulans tryptophan synthase gene. We thank Chris Helliwell for assistance with sequencing analysis of lambda clones, and Liz Dennis and Jim Peacock for support and helpful discussions. M.B.W. was supported by an Australian Research Council Future Fellowship (FT0991956). US helped design the study, carried out molecular studies and bioinformatics analyses and drafted the manuscript. NAS carried out molecular work, had intellectual input into the study design and helped draft the manuscript. KK and MA critically revised the manuscript. MA helped create the lambda library. MBW designed this study and drafted and revised the manuscript. All authors read and approved the final manuscript.